As promised, we are back for part two of our Fabulous Friday blog post. 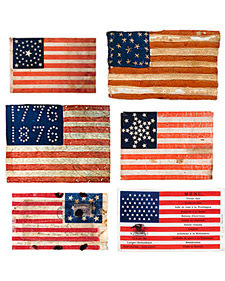 In light of the holiday, we want to share all things red, white, and beautiful. This Independence Day should be celebrated in style. As Americans, it is our right to be fabulous! In this issue of W Magazine, Blake Lively sports a patriotic look clutching the American flag. I'm a huge fan of her style. From Gossip Girl to the Green Lantern, she never fails to look amazing. 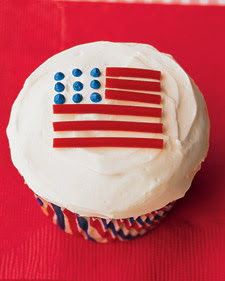 Courtesy of MarthaStewart.com, these American Flag cupcakes are a tasty patriotic treat at any Fourth of July picnic. Speaking of parties, we have a few place settings we fell in love with. This one from Anthropologie is rustic and shabby chic. 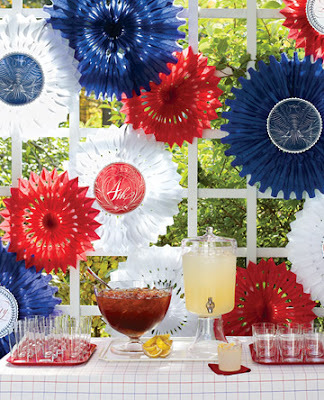 These paper fireworks from Martha Stewart add a nice nostalgic touch. 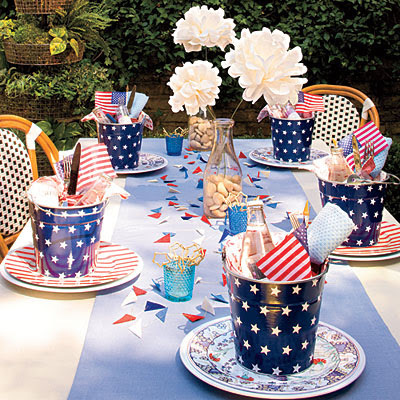 More traditional, these patriotic buckets from Southern Living maximize table space for all of your yummy BBQ dishes. 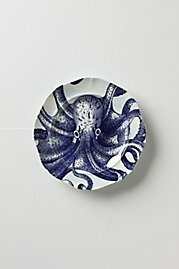 This plate from Anthropologie is fabulous. I'm all about the nautical animals this summer! 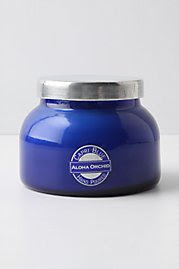 We sell Capri Blue candles like this one at our store in Galveston. Come by and see us! Pretty pretty! Blue accessories are very "in" this summer. 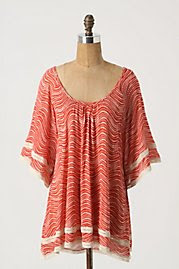 Paired with white jeans or shorts, this top from Anthropologie is a fashionable expression of patriotism at your Independence Day celebration. 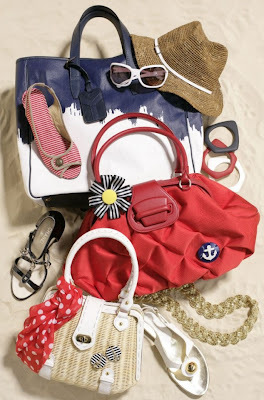 The Daily Mail featured these accessories for summer. 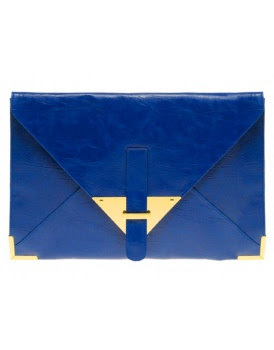 We found this clutch on Vogue.com. 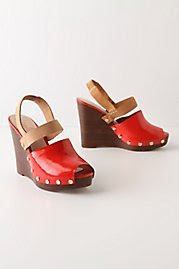 It's cute and affordable from Asos.com. 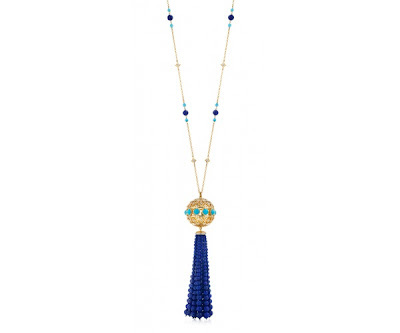 Just in case you haven't read our TGIF part one post, we featured Kendra Scott jewelry. 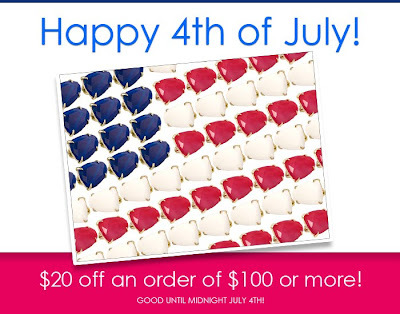 She is having a sale through July 4th. We suggest you take full advantage of this great deal! 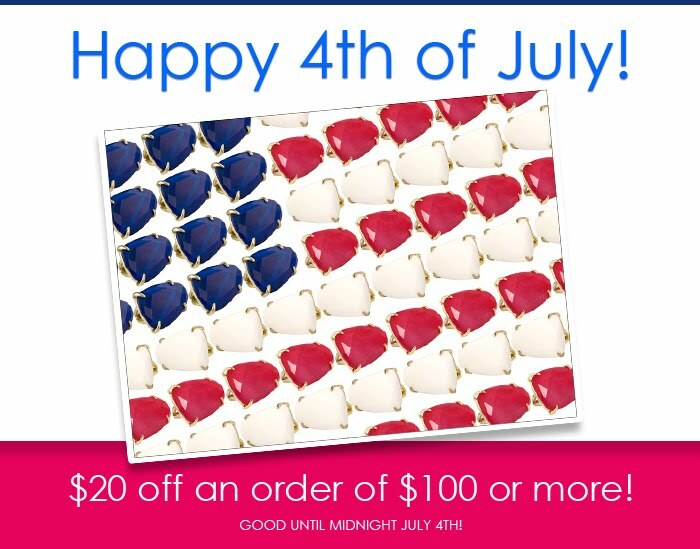 We designed this patriotic earring on the Kendra Scott website. We can't get enough of the Color Bar! 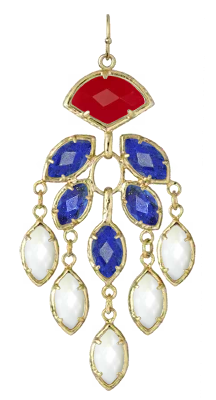 We think this earring looks like a firework! Parties, BBQ's and picnics are great ways to celebrate our nation's independence, but we must remember the real reason we are celebrating. Many, many soldiers have fought and died for our freedoms. HH Design House would like to take a moment to say heart felt thank you to our troops and veterans, especially our dear friend Chuck DeLongchamp, returning from Air Force depolyment on Tuesday!!! We are so proud of you and are proud to be Americans! We will be thinking of you this July 4th! You are always in our hearts. Happy Independence Day to all of our readers! We hope you have a safe, fun-filled, patriotic holiday! Happenings will be closed July 4th but will be opened Tuesday, July 5th. Don't forget to "like" HH Design House on Facebook and to check out our website. See you next week!